SuperKick Media once again returned to the fantastic Alternative Wrestling World to film and produce the DVD for their 9th Anniversary show. 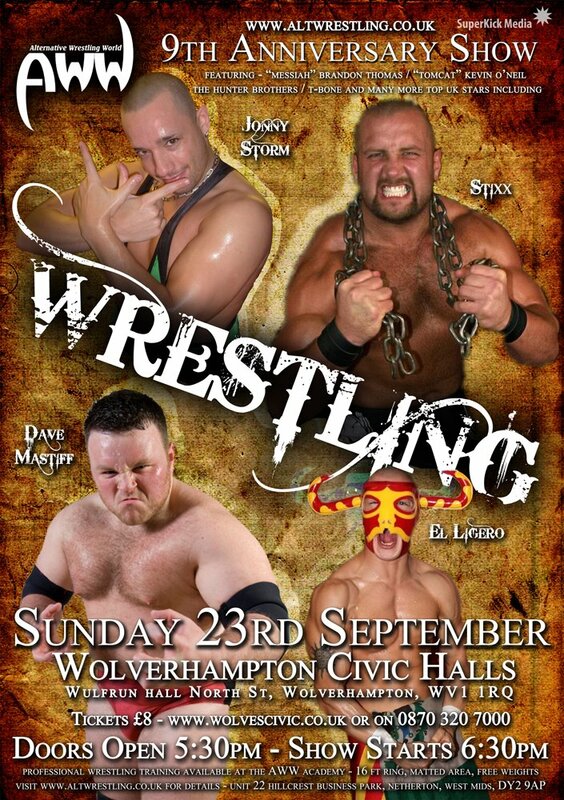 Held at the world famous Wolverhampton Civic Halls, a venue steeped in history for British Professional Wrestling, the event drew an excited crowd of almost 250. This event featured some of the most well-known names of the British circuit, including The “Heavyweight House of Pain” Stixx, The “Mexican Sensation” El Ligero, Dave Mastiff, “Tomcat” Kevin O’Neil, T-Bone and The “WonderKid” Jonny Storm. Also on the card was a brilliant women’s match between the mysterious Amazon and the beautiful Erin Angel, and a great tag match between the team of Tukay & Scotty Riot versus Dante & Matt Lightning. Highlight of the night for me was the vicious Team H8 versus The Dunne Brothers for the AWW British Tag Team titles and the AWW British Heavyweight championship match between Carnage and The “Messiah” Brandon Thomas. The evening was overseen by officials Ref Joel, and SuperKick’s own, Safest Hands in Pro Wrestling, Ref Paz. The host and ring announcer for the evening was The Master of Ceremonies, Hank McCoy. Special Guest timekeeper for the night was the fantastic FM102.5 The Bridge’s Gornal Trace.